There are various ways by which a page on Microsoft office word can be easily deleted and for this, there is no any hard and fast rules To Delete Page In Word. There is various type of basic solutions by which any unwanted page in the word can be easily removed or deleted from the desired word file. With the help of these solutions, any page or any blank page can be deleted and removed from the word file also at the time of editing. And all these tricks is workable in any word version whether its ms word 2003 or 2007 or 2016 or 2018 etc. all these are the general tips. If there is something written in the pages or there is a page between the two pages which is a blank page by mistake or there is any blank page or unwanted page in the file which is not needed then those blank or unwanted pages deleted easily. The user just has to view the blank page portion by navigating the whole page and click on the bottom of the page and then press the backspace key in the keyboard. Then this press the backspace key until the desired position by using this process the unwanted page and also the irrelevant blank spaces are deleted and removed from the word file. 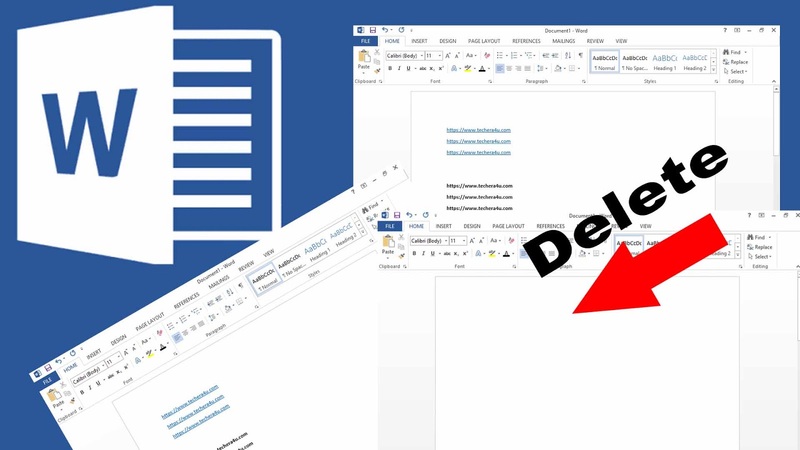 This step is one of the best answers for the question how to delete page in word very simply. And the next step if the easier one is not working in some case then detects what’s on the page by displaying paragraph marks and formatting symbols. First look on the blank page to see if there are any symbols, in which especially the paragraph mark or this symbol mark "¶". Select the symbol and delete it, and you will likely also delete your blank page. And also there some time the pages are not actually blank the is some sort of symbols or manual spaces which should be removed or deleted from the page which can be easily deleted by selecting it. And even if the blank page is in the middle of the document, it may be due to a manual page break. With paragraph marks turned on, Then in which a user will be able to see the page break. Then just Select it and delete it. These all are some normal steps by which a page will be deleted in the word and these all are the simple tips and tricks by which anyone can delete the page in word or delete any irrelevant and unwanted page in the word. The blank and unwanted pages are one of the biggest problems for the writers and the ms word users for which we think may be solved from these above simple steps. These all steps will help the users to delete pages from the word. You may also like: How to use multi-screen on android device.